after hybernation (standby mode). Some programs work incorrectly after hybernation. Therefore, You can make a *.bat file of these programs on restart and set this bat file launch on condition of leaving hybernation. Periodic conditions. 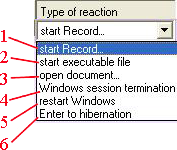 When You choose this type of reaction, You'll see a dialog box with parameters of periodic condition. It is necessary to put a tick in the first column for the task to be ready for activation. If a date has expired, it is colored dark pink . The same color is used if launch elements (Record, document, etc.) are not defined (for the task, where such elements are necessary). If it is less than 24 hours till the task is launched, the task date is colored green . The task is ready for activation, if none of its squares have precautionary color and there is a tick in the first column. For each task You can set time of notification in the last column . In this case, You can easily cancel an activated task. If You set "1000" in this column, the time will not count down. So it is for the user to decide, whether to start the task or not. 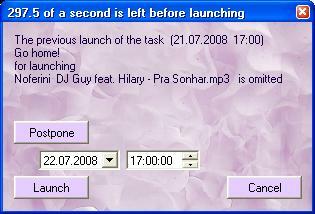 The window will help You to set the time period (within 24 hours) in which the chosen task must be activated. If You want the chosen task to be fulfilled in 30 minutes, set and press the button . 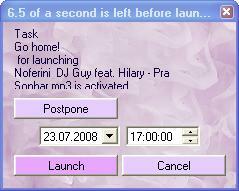 If the launch time was missed because of something (computer wasn't switched on or AutoClickExtreme wasn't launched), then, when AutoClickExtreme is launched, You'll see the dialog box with a message about the missed task.